The "platinum" in Wells Fargo Platinum Card would make you think you're getting a top of the line credit card full of perks and benefits, but don't get your hopes up. The Wells Fargo Platinum Card has a great introductory APR and (the possibility of) a relatively low-interest rate, but there aren't any rewards or premium cardholder services that would allow the Platinum Card to live up to its title. The Wells Fargo Platinum Card starts off being a great credit card with its 18-month 0% introductory APR on balance transfers and purchases. Balance transferred during the introductory period are only charged a 3% balance transfer fee (or $5 whichever is greater) as opposed to 5% after the promotion. However, after the introductory period ends, so do any significant perks of the card. There's no annual fee, which is always a plus. To its credit, the Wells Fargo Platinum Card does have one of the longest promotional periods of any credit card on the market. After the 18-month promotional period ends, the regular APR will be between 17.74% to 27.24% depending on your creditworthiness and you'll pay a higher balance transfer fee for any balance transferred after the promotional period. The good news for people with good credit scores, you'll qualify for a lower interest rate. If your credit score isn't so good, you can expect to get a higher interest rate. If you have a Wells Fargo checking account, you can use your credit card for overdraft protection and avoid the $36 overdraft fee. However, the fee for an overdraft protection advance is $12.50 if your daily overdraft is less than $50 or $20 if the overdraft for the day is greater than $50. Overdraft transactions are charged an interest between 24.24% and 26.24% (depending on your creditworthiness) from the date of the advance. Linking your checking account to a savings account for overdraft protection is much cheaper, assuming you keep enough funds in your savings account. A nice little perk found in the fine print: Wells Fargo will cover the theft of or damage to your cell phone (up to $600 per occurrence and $1,200 per 12 month period) if you pay your cell phone bill with your credit card. If you're paying for handset coverage through your cell phone provider, you can consider canceling that service. One caveat, Wells Fargo's Cellular Telephone Protection doesn't cover a loss. Balance transfer fee: 3% or $5 during the introductory period, 5% after that. Late payment fee: Up to $35. Returned check fee: Up to $35. 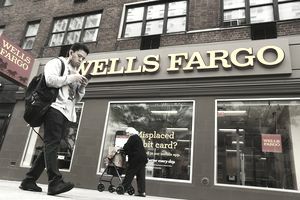 If you're a Wells Fargo customer and want a credit card with them, why not get the Wells Fargo Cash Back Card or the Wells Fargo Rewards Card? Both cards pay you a 1% reward on your spending with the Cash Back Card paying in, well, cash and the regular Rewards Card paying in points. If you have a home mortgage with Wells Fargo and want to pay it off early, you might be interested in the Wells Fargo Home Rebate Card. You get 1% back on your spending, credited to your mortgage account. If you are rebuilding your credit or have poor credit you might need a secured card. Check out the Wells Fargo Secured Credit Card. It's one of the best secured credit cards on the market. Credit card terms and signup bonuses are subject to change from the time of this review.